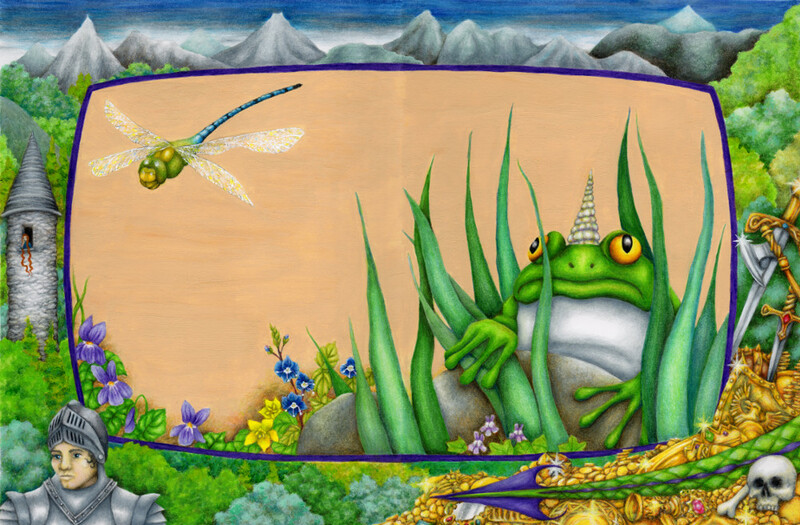 This illustration is a double page spread from the children’s picture book, ‘The Loveliest of all was the Froggicorn,’ by Kay Green. In this book a series of mythical beasts tell their tales to the Ancient Teller of Stories. The text only gives a few hints about each creature’s tale, and I used the illustrated border of each spread to explore the beasts’ stories further or to give a sense of some of their cultural or geographical origins. In this illustration, the Froggicorn is listening to the dragon tell of his past exploits, his battles with brave knights and the princesses he has kidnapped! You can order the book from your local bookshop, or buy a copy, signed and personalized by me, from my online shop.